Shin splints are one of the most common injuries known to athletes. Shin splints are a term commonly used to describe most lower leg pain. However, shin splints are only one of several conditions that affect the lower leg. The most common causes of lower leg pain are: general shin soreness; shin splints; and stress fractures. For the purpose of this article, I'll only be addressing the first two. I'll save the topic of stress fractures for another issue. Before I move on to shin splints, I want to quickly cover the topic of general shin soreness. Shin soreness is simply a muscular overuse problem. By using the R.I.C.E.R. regime you'll be able to overcome 95 percent of all general shin soreness within about 72 hours. As you can see from the diagram to the right, there are many muscles and tendons that make up the lower leg, or calf region. It's quite a complex formation of inter-weaving and over-crossing muscles and tendons. •	The Tibia and Fibula. These are the two bones in the lower leg. The tibia is situated on the medial, or inside of the lower leg. While the fibula is situated on the lateral, or outside of the lower leg. •	There are also a large number of the muscles that attach to the tibia and fibula. 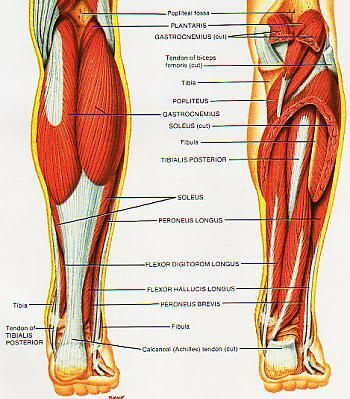 It's these muscles, when overworked, that pull on the tibia and fibula and cause the pain associated with shin splints. Specifically, the pain associated with shin splints is a result of fatigue and trauma to the muscle's tendons where they attach themselves to the tibia. In an effort to keep the foot, ankle and lower leg stable, the muscles exert a great force on the tibia. This excessive force can result in the tendons being partially torn away from the bone. Shin splints are commonly associated with sports that require a lot of running or weight bearing activity. However, it is not necessarily the added weight or force applied to the muscles and tendons of the lower leg, but rather the impact force associated with running and weight bearing activities. In other words, it's not the running itself, but the sudden shock force of repeated landings and change of direction that causes the problem. When the muscles and tendons become fatigued and overloaded, they lose their ability to adequately absorb the damaging shock force. The major biomechanical inefficiency contributing to shin splints is that of flat feet. Flat feet lead to a second biomechanical inefficiency called over-pronation. Pronation occurs just after the heal strikes the ground. The foot flattens out, and then continues to roll inward. •	Running with your toes pointed outwards. Since about half of all lower leg problems are caused by biomechanics inefficiencies, it makes sense to get the right advice on footwear. Your feet are the one area you should not "skimp" on. The best advice I can give you concerning footwear, is to go and see a qualified podiatrist for a complete foot-strike, or gait analysis. They will be able to tell you if there are any concerns regarding the way your foot-strike or gait is functioning. After your foot-strike has been analysed, have your podiatrist, or competent sports footwear sales person recommend a number of shoes that suit your requirements. Good quality footwear will go a long way in helping to prevent many lower leg problems. Apart from good footwear, what else can you do? I believe the following three preventative measures are not only very effective, but crucial. Secondly, flexible muscles are extremely important in the prevention of most lower leg injuries. When muscles and tendons are flexible and supple, they are able to move and perform without being over stretched. If however, your muscles and tendons are tight and stiff, it is quite easy for those muscles and tendons to be pushed beyond their natural range of movement. To keep your muscles and tendons flexible and supple, it is important to undertake a structured stretching routine. For a comprehensive reference of over 100 clear photographs of every possible sports related stretch, consider getting a copy of The Stretching Handbook. If you're interested in stretches for the lower legs, The Stretching Handbook has 22 different stretches you can do. Order your copy now! And thirdly, strengthening and conditioning the muscles of the lower leg will also help to prevent shin splints. There are a number of specific strengthening exercises you can do for these muscles, but instead of me going into the details here, I have simply found another web site that has already done all the hard work. It explains a number of exercises you can do for preventing shin splints. You can find these strengthening exercises by going to http://www.watfxc.com/TF/TF%20Education/shin_splints.htm. The above-mentioned article is the only other article I found which included a comprehensive section on shin splint prevention. If you're only interested in the strengthening exercises, you'll find them towards the end of the article. If however, you suffer from shin splints or you're looking for more information on shin splints, I recommend you read the entire article. How to Treat Shin Splints! Firstly, be sure to remove the cause of the problem. Whether is be a biomechanical problem, or an overload problem, make sure steps are taken to remove the cause. The basic treatment for shin splints is no different to most other soft tissue injuries. Immediately following the onset of any shin pain, the R.I.C.E.R. regime should be applied. This involves Rest, Ice, Compression, Elevation, and Referral to an appropriate professional for an accurate diagnosis. It is critical that the R.I.C.E.R. regime be implemented for at least the first 48 to 72 hours. Doing this will give you the best possible chance of a complete and full recovery. The next phase of treatment (after the first 48 to 72 hours) involves a number of physiotherapy techniques. The application of heat and massage is one of the most effective treatments for speeding up the healing process of the muscles and tendons. I have found, both from personal experience and from working with many clients, that this form of treatment is the most effective. The application of heat and deep tissue massage on the effected area seems to bring the best results. If you suffer from shin splints, be sure to spend at least a few minutes massaging the effected area both before and after you exercise.